Breakfasts can be hard for me since I don’t typically enjoy regular breakfast food. 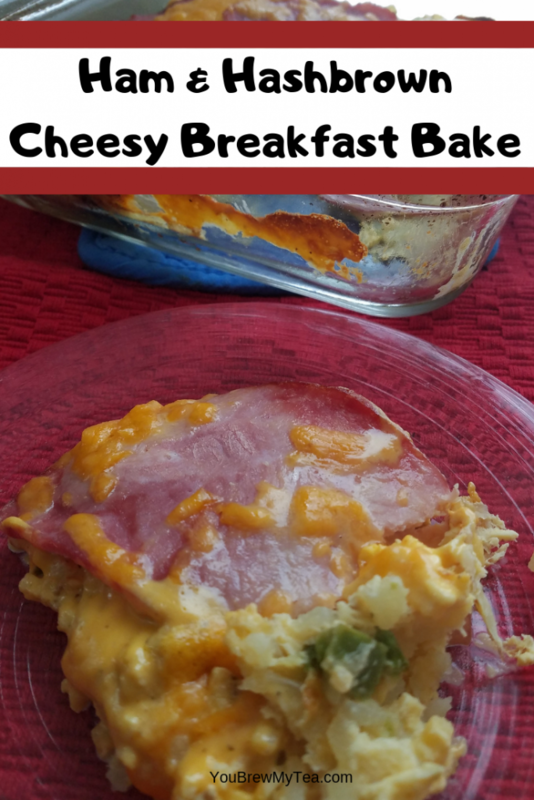 This Easy Ham and Hashbrown Casserole Bake is a new idea that is similar to others out there, but a bit less eggy. Yes, I know, eggs are great for you, but they just aren’t my thing. So, this recipe ends up being just right for me to make and use throughout the week. This post contains affiliate links. I earn a small commission when you make purchases using these links. Basic recipes that are easy to make in just a few minutes are my favorite. 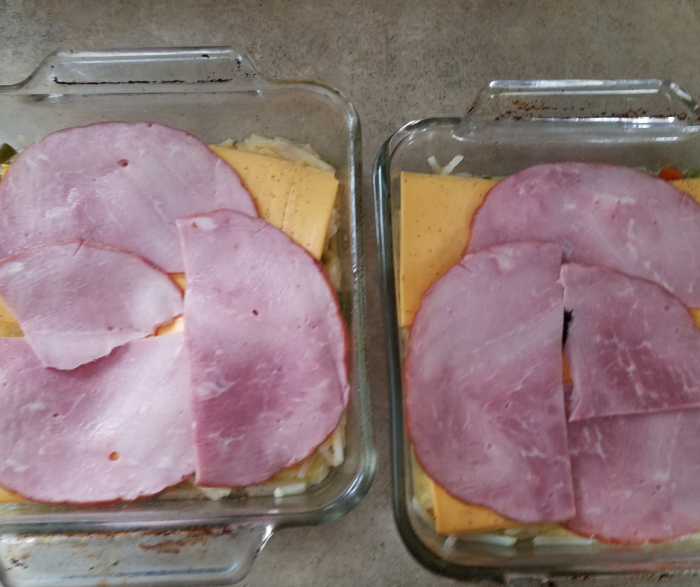 While I love gourmet foods, something like this ham and hashbrown casserole is more my style for every day. In fact, I whipped this up in under 30 minutes over the weekend, and once cooled, portioned into containers so all I have to do is pop the lid and stick in the microwave for 1 1/2 minutes in the morning. By the time it is done, I can have an apple washed and sliced and a complete breakfast for low points. I love this new to me kitchen gadget. The Freshware Vegetable Chopper is super easy to use, and it made prepping my bell pepper and onions take literally 1 minute. Seriously, this is how I make prep so fast and easy! It’s inexpensive and super handy. 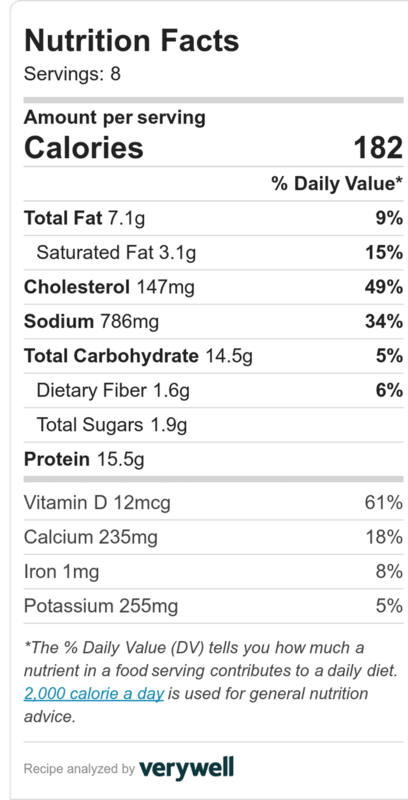 Also, I can’t make this recipe without using my Digital Kitchen Scale. I find weighing out the hashbrowns the best way to get a most accurate point count for this recipe. Otherwise, I feel like I am just “guessing” and I have learned from the past that “guessing” doesn’t help me with portion control. 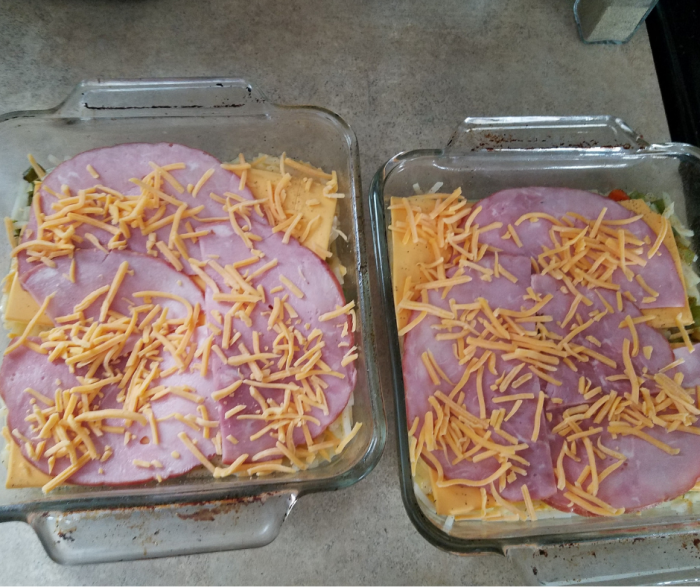 You can dice your ham up and mix in with the potatoes and egg, but I took the lazy way and just laid the slices of ham out on top. Either way works and will cook up fine, you’ll just want to make sure you weigh your ham for the most accurate points measurement if on the WW FreeStyle Plan. Spray a 9″x13″ with non-stick spray (note, I show using two 8″x8″ pans since my 9×13″ was in use already, but either will work) and set aside. In a small non-stick skillet, cook diced onion and bell pepper until tender. I add a small amount of water or chicken broth to prevent sticking. Once vegetables are finished cooking, set aside. 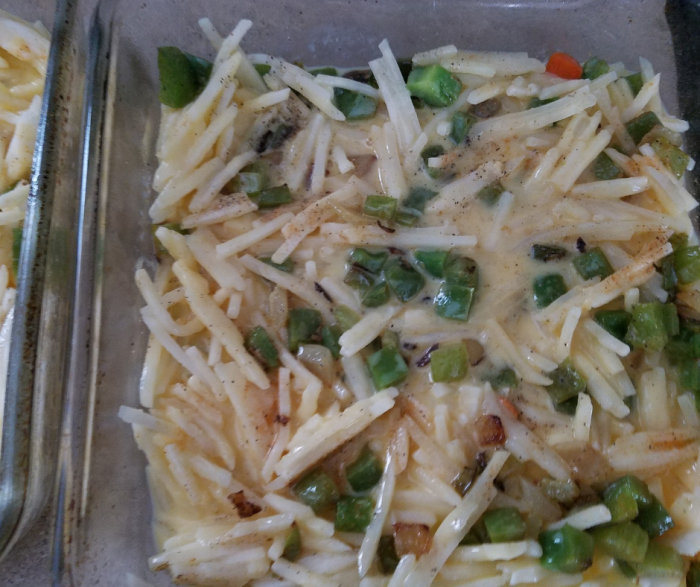 Spread the hashbrowns over the bottom of the casserole dish and sprinkle with the salt and pepper. In a small bowl, beat eggs and seasoned salt until frothy. Pour the eggs over the hashbrowns then top with cooked bell peppers and onions. Bake at 400°F for 20 minutes or until eggs cooked through and cheese is melted and bubbling on top. Spray a 9"x13" with non-stick spray (note, I show using two 8"x8" pans since my 9x13" was in use already, but either will work) and set aside. This is a great recipe for a weekend breakfast, but I like making this on my meal prep day then putting into portion controlled containers. I leave out in the refrigerator up to 5 days. To reheat them, I just pop into the microwave for 1 1/2 minutes. If heating from frozen, I will cook up to 3 minutes or until heated through. 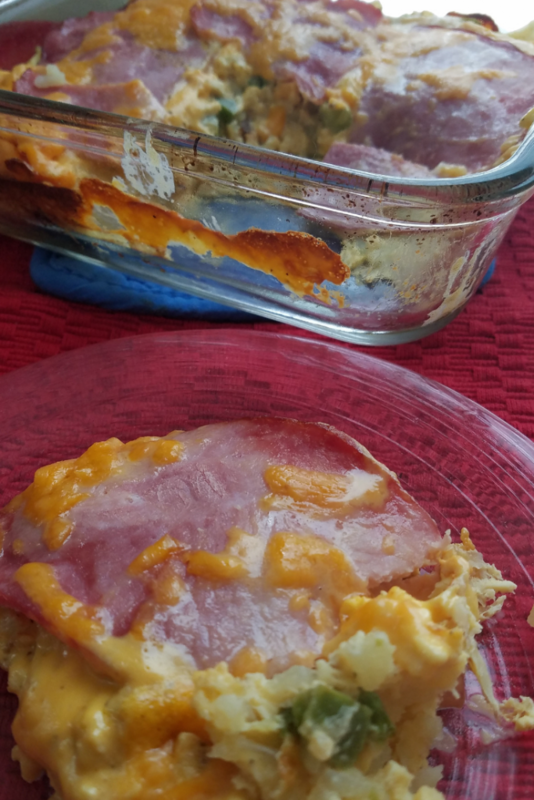 I like these Rubbermaid Premier Storage Containers for single serving items like this breakfast bake. They are the right size, and they work well freezer to microwave. This is preferred for this over the glass freezer storage if I am not able to thaw fully overnight. 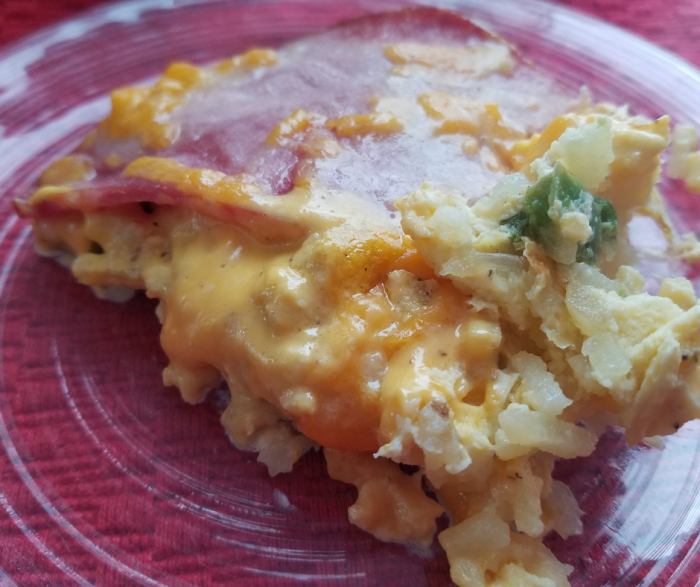 Since breakfast is such an important part of my food routine now, I love making this ham and hashbrown casserole in batches to have all week long. However, I, like others, get burned out eating the same thing every day. That’s why I have such a good variety of breakfast items on my menu and plan for the month. Below are some of my other favorites that I know you will enjoy!